China's Leverage — And Its Limits — In North Korea : Parallels President Trump blames China for not doing enough to contain North Korea's nuclear threat. But how much influence does China really have on Pyongyang? 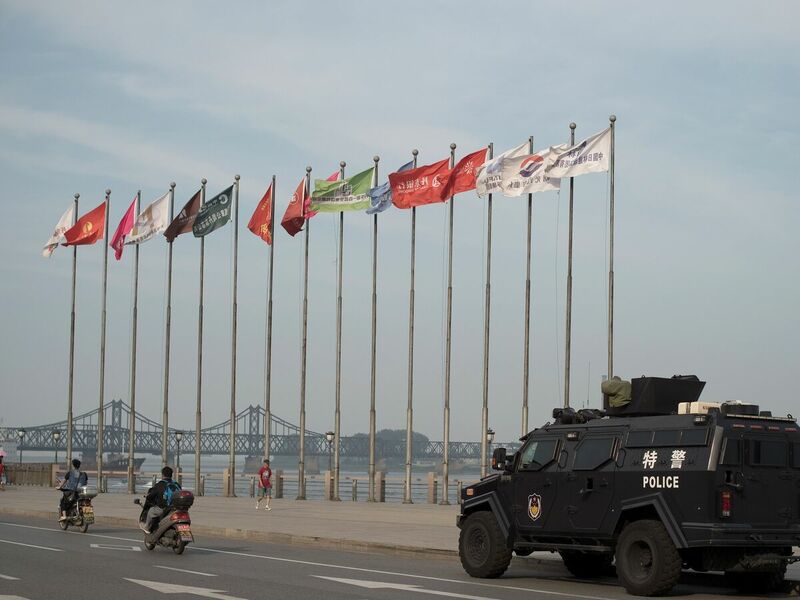 An armored Chinese police van is seen next to the Friendship Bridge on the Yalu River connecting the North Korean town of Sinuiju and the Chinese city of Dandong. China is North Korea's biggest trading partner. Following North Korea's second test of an intercontinental ballistic missile last Friday, President Trump didn't hold back: "I am very disappointed in China," he tweeted. Then he brought up China's trade surplus with the U.S., saying despite it, "They do NOTHING for us with North Korea, just talk." On Monday, China's official news agency, Xinhua, responded in an editorial: "Emotional venting cannot become a guiding policy for solving the nuclear issue on the peninsula." Such is the state of public diplomacy between these two global powers in the face of an advancing nuclear threat in Northeast Asia. So far, to try to achieve more cooperation with China, Trump has gone from trying to charm Chinese President Xi Jinping at Mar-a-Lago to tweeting his disappointment — and now, openly threatening the U.S.-Chinese trade relationship. How much can China actually do to help influence the situation in North Korea? China shares its northeast border with North Korea. During the Korean War, it fought with North Korean leader Kim Il Sung's troops, and today is Pyongyang's largest economic link to the rest of the world. China accounts for at least 85 percent of North Korea's trade — up from last year, despite North Korea's provocations and subsequent sanctions. "Trump is right that China has the most leverage over North Korea of any country because of the decades-long relationship and economic relationship between the two sides," says Amy King, a lecturer at the Australian National University. But, she says, constantly insisting that China do more "abrogates [other countries'] own responsibility, particularly in the case of the U.S." In other words, she believes, the U.S. could be doing more outreach to North Korea on its own instead of criticizing China. That's a point Chinese diplomats are making, too. "If the two principal parties [the U.S. and North Korea] refuse to move toward what is required by the Security Council resolutions — de-escalation of tension, negotiations to achieve denuclearization and peace and stability and also resume dialogue — then no matter how capable China is, China's efforts will not yield practical results because it depends on the two principal parties," said the Chinese ambassador to the United Nations, Liu Jieyi, in a press conference this week. What has China done to curb North Korea's nuclear ambitions so far? The workings of the Chinese government aren't transparent, to say the least. So it's unclear exactly which levers it is or isn't pulling with Pyongyang. Here's what we know: China has officially signed on to a few rounds of sanctions on North Korea in recent years, and contends it's done a lot. Xinhua's opinion piece this week asserts China made "painstaking efforts over many years" to resolve the North Korean nuclear issue. Ties have grown frostier between Beijing and Pyongyang, which has openly criticized China for siding with the U.S. on sanctions. From China's perspective, Chinese businesses are hurt more by these sanctions than those of other countries because of the level of trade between the two countries. "The U.S. has no reason to blame China," says Lu Chao, an expert on China-North Korea cross-border relations at the Liaoning Academy of Social Sciences in the northeastern Chinese city of Shenyang. Enforcement of those sanctions is spotty, though. And China pushed for a "coal loophole" in last year's sanctions package that allowed it to continue to buy coal from North Korea. China accounts for some 30 percent of North Korean coal exports. Why hasn't China done more? The U.S. and China agree on not wanting to see a nuclearized North Korea. After all, Pyongyang's nuclear weapons would pose a threat to China, too. But they don't agree on how to get there. China has advocated direct negotiations between Pyongyang and Washington and doesn't believe more sanctions will solve the main problem. So it's not motivated to keep increasing sanctions. It also doesn't want to squeeze the regime so hard that the North Korean government collapses. Also, there are limitations to what China, as a state, can do to curb ties. It's not giant, state-owned enterprises involved with North Korea — it's smaller businesses who help smuggle goods into North Korea, and they're often protected by local authorities. What does China want to see happen to "resolve" the North Korean nuclear issue? How does it differ from the U.S.? China advocates negotiations to achieve a freeze on North Korea's nuclear development, in exchange for the U.S. and South Korea halting their annual joint military exercises in the peninsula. The Trump administration, however, and its predecessors, have refused to negotiate directly if North Korea won't agree to denuclearize first. China blames this U.S. position for the standoff, and many Chinese observers suspect America is unwilling to negotiate with North Korea because the nuclear crisis provides a pretext for the U.S. to beef up military forces in Asia and contain China. The U.S. has denied this and diplomats say they have made various back-channel attempts to talk with North Korea, only to be rebuffed. Given this stalemate, North Korea has filled the time by steadily increasing its nuclear capability. Nobody knows for sure. We've outlined the general baskets of U.S. options previously. And when it comes to U.S. cooperation with China, relations have soured in recent weeks, with reports that the U.S. is preparing trade measures against China. Long-brewing tensions over China's claims to islands in the South China Sea continue. Meanwhile, North Korea says it won't negotiate away its nuclear weapons. "Unless the U.S. fundamentally eradicates anti-[North Korea] policies and nuclear threats," said a Monday editorial from the state-run Rodong Shinmun, "we will never put our nuclear weapons and ballistic rockets on the negotiation table."